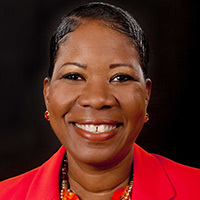 Dara Richardson-Heron, M.D., was named CEO of YWCA USA in December 2012. Featured in The New York Times as one of four women chief executives discussing female voices in leadership, she is using her platform to lead the YWCA USA and 225 YWCA local associations, together the 25th-largest nonprofit in the nation, in building a national movement for the elimination of racism and the empowerment of women. Richardson-Heron regularly represents the organization on Capitol Hill, at the White House, and in the media. She has been featured in CNN, Forbes, Chronicle of Philanthropy, Huffington Post, Nonprofit Times, and Black Enterprise, among others. She has received numerous awards, including Woman of Excellence in Philanthropy, “25 Influential Black Women in Business,” and the YWCA Academy of Women Achievers. She has been named one of the “21 Leaders for the 21st Century” and also included in the Ideagen Impact 100 list. In 2013, 2014, and 2015, she was named to The Nonprofit Times “Power & Influence Top 50” CEO list and in 2015, she was honored with the Distinguished Alumna Award from Barnard College, her alma mater.